This is genuine Swarovski Crystal, which is manufactured in Austria. The size is SS 34 (~7.2mm) and the colour is Rose Peach (262). Swarovski crystals are brighter and sparkling when compared to other crystals due to patented manufacturing processes. To produce a diamond-like effect th.. This is genuine Swarovski Crystal, which is manufactured in Austria. 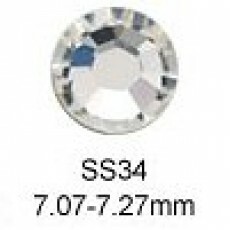 The size is SS 34 (~7.2mm) and the colour is Jet (280). Swarovski crystals are brighter and sparkling when compared to other crystals due to patented manufacturing processes. To produce a diamond-like effect the crystal glass is.. This is genuine Swarovski Crystal, which is manufactured in Austria. The size is SS 34 (~7.2mm) and the colour is Fern Green (291). Swarovski crystals are brighter and sparkling when compared to other crystals due to patented manufacturing processes. To produce a diamond-like effect the cry.. This is genuine Swarovski Crystal, which is manufactured in Austria. The size is SS 34 (~7.2mm) and the colour is Fuchsia (502). Swarovski crystals are brighter and sparkling when compared to other crystals due to patented manufacturing processes. To produce a diamond-like effect the crystal glas..